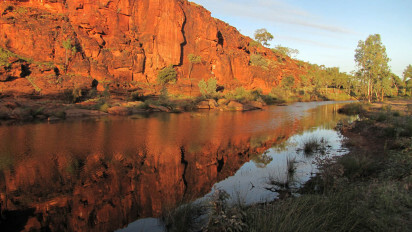 Running Waters is situated about 200km south west of Alice Springs on the Finke River. 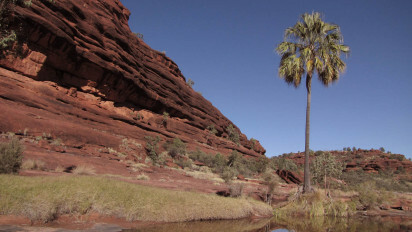 It is one of the few permanent waterholes providing a remote haven for plants, fish, birds and animals. We invite you to immerse your self in this beautiful place, revel in its rich colours, textures and abundant beauty, and let your creative juices flow... like running water. Ruby Gap feels wild and adventurous, as it’s not an easy place to get to. 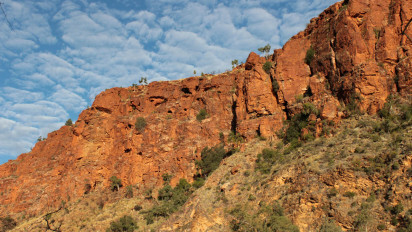 The four-hour drive takes us deep into the East MacDonnell Ranges. We travel past Arltunga, with its remains of the gold rush era, then on an increasingly difficult 4WD track to the sandy bed of the Hale River with its abundant (tiny) garnets, which were originally thought to be rubies, hence the name. 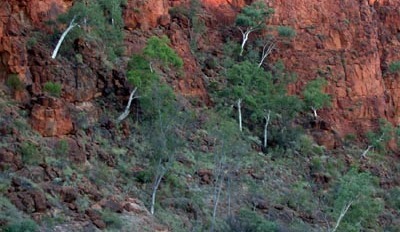 The campsite is nestled below majestic red cliffs. We are very excited to be going back to Palm Valley! Our exclusive campsite has been upgraded with HOT SHOWERS and FLUSH TOILETS! Conrad Ratera, senior Traditional Owner for Palm Valley will provide us with a special opportunity to learn about about his connection to the area and the aboriginal lifestyle. This ever popular camp location now has even more to offer! 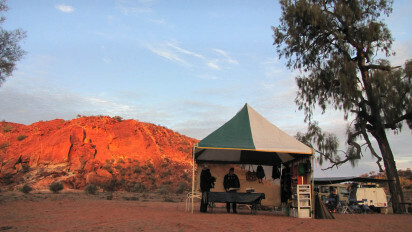 With our own exclusive campsite and very comfortable camp infrastructure this is an unparalleled opportunity to create in the heart of Namatjira country, explore its detail, its vastness and its spirit. 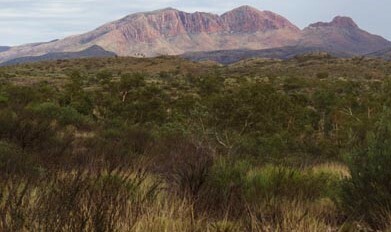 There will be day trips by 4WD to some of the most spectacular locations in the West MacDonnell National Park. Charlie and I have a long term, intimate connection with this very special location and we would love to share with you its many treasures. Some of them we like to think of as secrets! Perhaps our most remote camp site yet, this beautiful place is located deep in Aboriginal country south west of Alice Springs. From the towering red cliffs laced with the white trunks of ghost gums, the permanent creek, the wind sculpted sandstone, salt patterned pebbles and beautiful trees there is much to discover and immerse oneself in. 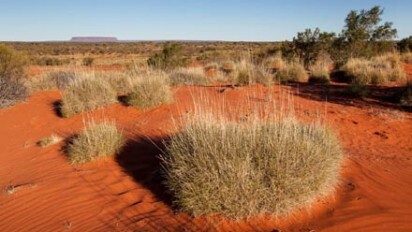 It is a highly sensitive Aboriginal cultural area and being there is a privilege few people have the chance to experience. It's definitely not on the beaten track! This accommodated Creative Camp gives us access to the further end of the East MacDonell Ranges in comfort at the iconic Ross River Resort. Distinctly different from the better known West MacDonnells the Eastern Ranges have special feel ... beautiful, rugged and wild but yes, somehow different. The tract of country between Ross River and Ndhala Gorge is particularly spectacular. We will take day trips into this country to work and explore. 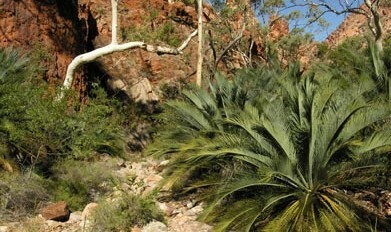 We will also visit Trephina Gorge, John Hayes Rock Hole and Corroborree Rock as art making and photographic locations. NEW LOCATION! We are lucky to have been given access to a part West MacDonnell Ranges where people don't usually have the opportunity to camp unless walking on the Larapinta Trail. From this location we can spend time in Stanley Chasm itself, or the more adventurous can 'sample' sections 3 and 4 of the Trail and draw inspiration from this deeply folded and rugged terrain. The campsite itself is very comfortable with more semi permanent infrastructure than our remote camps. 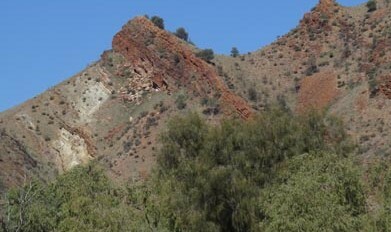 There is red rock gully at the back of the camp, a great drawing place and brilliant views of the ranges from the track into camp. 8 days/7 nights fully accommodated at Curtin Springs Station east of Uluru with a focus on making and working with paper. We will make our own paper using native grasses, experiencing the entire process from collecting the grass, boiling, blending and pressing, through to the finished paper. We will then work with the paper in different ways, experimenting with a variety of drawing, painting and collaging media, including those sourced from the environment; ochre, charcoal and rust. You will be encouraged and supported to find the ways to express yourself and your unique vision through the paper, from the earth up. This accommodated Creative Camp will be based in the tranquil surrounds of Campfire in the Heart, a small retreat style venue on the edge of town, close to the Eastern range. Each day we will venture out, visiting wonderful, wild places that only the locals know, as well as some of the better known locations on the eastern side; Trephina Gorge, Emily Gap and N'dhala Gorge. This Creative Camp with be as adventurous and exciting as always but will have all the creature comforts you need to truly unwind, create and commune with fellow creatives. Karlu Karlu is otherwise known as the Devils Marbles, an extraordinary series of rock formations near Tenant Creek, north of Alice Springs. Huge rounded boulders balance upon one another with gravity defying delicacy. 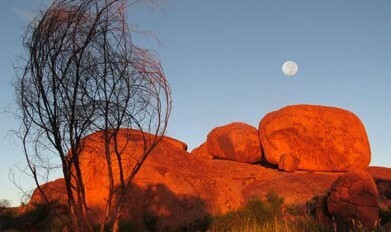 It has a powerful resonance and huge cultural significance for a number of neighbouring Aboriginal groups. We plan to be there at full moon to take advantage of night painting and long exposure photography. A first time adventure for us too! For artists, photographers and writers this place is rich in its colourful terrain, its sculptural rock formations and its cultural heritage. 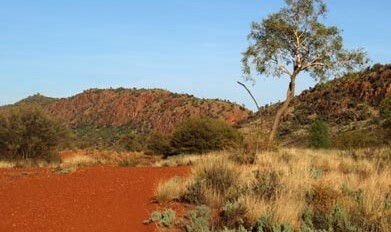 It is set amidst beautiful red sand and spinifex country with stands of desert oaks and rugged cliffs. The campsite has a toilet and shower cubicle so it’s a step up in luxury from our usual ‘bush’ camp. It is indeed a privilege to be at this remote and sacred place with only the local family and their camels as visitors.